Now that I'm back in the reading game, I decided to keep it light. I don't want to knock myself back down in the doldrums with some heavy hitting fantasy, so I kept it simple with some steampunk comics! My mom started doing her version of LitCube for me this year. This month was Metal May, an all steampunk themed box. It seems only appropriate that I also happened to unknowingly get the Lady Mechanika series on Netgalley for the big May release of Volume 3. This first Volume collects together the comics of the Mystery of the Mechanical Corpse. Lady Mechanika introduces you to some pretty standard steampunk tropes with a cyborg woman dressed in Victorian gear running around solving Holmesian crime dramas. The kicker is I actually find these escapades interesting and her surrounding cast of characters enjoyable. 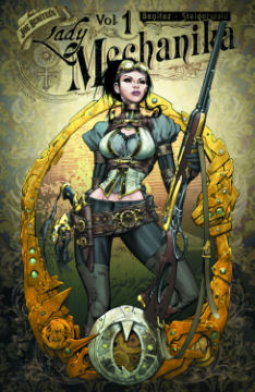 The mystery is also entwined with the greater saga arching mystery of who made Lady Mechanika. Surprisingly, I actually want to stick around and found out who-dun-it. I think I have finally found a comic that I don't begrudge $3.99 per episode, though I'm still not willing to pay it. I'm cheap and comics will never be a thing for me for that exact reason. But this one almost makes me cave in. Almost. Instead, I'll wait for the collected volumes at a cheaper price and one shot couch potato reading. So stereotypes abound and lead on, for now, you can get a taste of Lady Mechanika for free with The Demon of Satan's Alley prelude chapter, here.